Hopfield neural net artificial intelligences may ride along with astronauts on future missions, helping them to discover alien life. That’s the vision of a research team led by Patrick McGuire, a University of Chicago geoscientist who’s developed algorithms that can recognize signs of life in a barren landscape. The Hopfield neural network compares new data against patterns it's seen before, looking for unusual inputs. In a research paper, McGuire shows that the system was able to differentiate lichen from surrounding rock. The system is also intended to use wavelengths of light that are invisible to human beings, therefore seeing details that people cannot and reasoning about them in human-like ways. 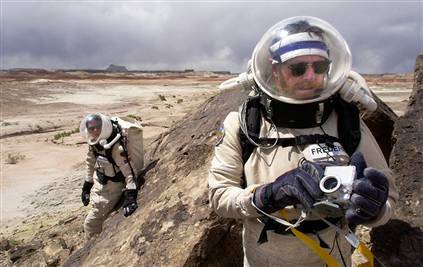 The lichen tests were conducted in Spain and at Utah’s Mars Desert Research Station, where two of the researchers donned spacesuits and lived for two weeks in the field as astronauts. They carried hand-held digital microscopes and cell phone cameras, which sent the data via bluetooth to netbooks running McGuire’s Hopfield network. The lichen identification was based on color data. McGuire next plans to train the network to process different textures. Ultimately he wants to conduct analysis at different scales, from the microscopic up to landscape-wide. Each astronaut in the crew has a small subtree or "imp" that stays with him or her to act as the communication link to the main computer. Most of the crew have the tiny imp ride on their shoulder, although some of the women prefer to keep theirs in their hairdo. In addition to acting as the communication link to the computer, the imps also act as health monitors and personal servants. Any other favorites for this category, readers? Read more at Blogdig and Wired.